I have had enough... I'm up to my ears. More like, up to my sinuses, with this mess. I think the Grinch isn't actually a green furry fella - but a sinus infection that doesnt want to go away on me & has tackled the hubs down to a pile of yuck. I ended up taking a few days off work Thursday & Friday & ended up getting all my shopping done for Ricky on Thursday, & then headed out on Friday for what has become an annual tradition - shopping with my momma. We didn't get a whole lot done but the point of those outings are to just get done what we can & just have fun doing it. Goal achieved. ... especially when we found that Burger King has a new thing called "Cheese Curds"... we had no idea what that was but anything with the word 'cheese' in it HAS to be good so we ordered some. & besides burning our fingers & the roof of our mouth on them - they were delicious. Tis the season to throw out all care of calories. Especially while shopping. & while I was out shopping, my poor hubby was coming home early from work. He NEVER comes home early for work. He was HORRIBLE with a sinus infection - which I'm not too sure it wasn't / isn't the flu. He's had a fever for the past 6 days & he's just achy in his neck & back & just feels horrible. When he's suggesting going to the doctor - or even thinking about the ER - you KNOW its bad. Poor guy. So once again, Saturday, we had TONS of plans & he just felt so bad, we said life just has to go on hold. It doesnt matter how close it is to Christmas. We had plans to finish shopping & go to his work Christmas party. Nope - I made some breakfast & we pretty much camped out in the living room with Christmas movies on Netflix & Ricky sleeping 90% of the day while I just knitted & laughed so hard, I thought for sure I was going to wake him up... nope - he was that out of it. Ricky had to even miss his work's Christmas party which he's never done... again, you KNOW he felt bad to make that happen. I feel so bad for the guy. 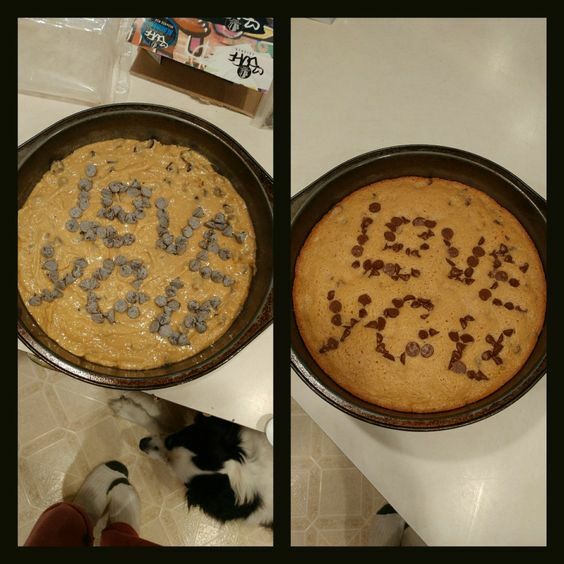 He was craving something sweet so I made him some blondie brownies & tried to perk him up with a little message. He did appreciate it, but it didn't cure him. Sunday, he was still not top notch so he stayed home while I went to MSM to have fun with our Christmas party. It's the last gathering we have for the year - I had to wish my girls a Merry Christmas.... & try not to throw up while they were playing a game that was an eating challenge. Things that included a can of sardines - a can of Spam (I swear it smelled like dog food) & pickled pigs feet. At one point, I had to walk away & go to the other side of the room.... it was horrid. But those kids are up for anything & tackled it all. Even wrapping up a person like a gift. I met up with Ricky after MSM so we could go to his sister's for our Vincent Christmas. I love so much his sister has everyone over every year - the Sunday before Christmas. It works out so well & I just love seeing everyone. I just adore my Vincent family. My sister in law always makes the BEST dinner for us. & I always say it & I'll say it again - I so appreciate that she caters to my vegetarian ways. I know its not always the easiest thing to do, but man, she does me up RIGHT. We are all so thankful for her gracious hosting & time & energy she takes to prepare the day for us. We had so much fun laughing, figuring out how to put toys together, playing games (I DONT CHEAT!!!!) & just getting to spend time with one another. Time is so precious. It's always so wonderful to have Michael's son there. I think the holidays always brings up the wounds of a missing family member. & Evan's momma is so lovely in making sure Evan is still a part of the Vincent family. We all love Evan & his momma so much. They ARE Vincent family... no doubt. I always adore getting to spend time with my niece & nephews too. They are both just such good kids... I will put these two up against anyone's niece & nephew. They are just so amazing to me. & getting to share in the holidays with family... even when you're not feeling 100%, it all makes Christmas even more wonderful. Did you do any Christmas celebrating this weekend? Has the horrid Grinchy Sinus infection got you yet? Are you ready for the final week till Christmas!?!?!? What a lovely Christmas party she hosted! Just curious as to what vegetarian food she makes you? I think as we get older we appreciated (and sometimes crave) family traditions like that party your SIL hosts. Every year my family does something different cus some people are home, some are not, and others are growing up and moving on. It's sad really. I'd love to have some tradition with extended family to look forward to every year because as you know they're ot gonna be around forever. We finished up our Christmas shopping this weekend and I am SO relieved. I've never been able to relax the last week of Christmas. Today I am going food shopping and then I'll be done! I LOVE cheese curds. Had them in Wisconsin. They're kind of like mozzarella sticks, but WAY better. No celebrating this week - just a fun holiday-ish party. We're getting together with my MIL after Christmas. I'm not really a gift oriented person, so presents don't do much for me. Christmas for me is a lot more about the traditions & seeing my people. EVERYONE is sick...my friend just got over the flu that knocked her flat out for a week and a half! hope ricky gets better soon! I hope you and Ricky are feeling better! Nothing worse than being sick during the holidays. Boo! Cheese curds are amazing. As a neighbor to Wisconsin, we have some great cheese curds here, especially our State Fair. Have a wonderful Christmas with your family and get better! I'm very curious about Burger King cheese curds...here cheese curds are what goes on top of fries before the gravy to make poutine! I hope you are feeling better soon and can enjoy all the Christmas celebrations you have planned! I love all your Christmas pictures! I hope your sinus troubles go away soon!! I've been waking up with headaches that I'm pretty sure are sinus related. Ugh. You and your momma are so cute in that first pic! Sickness is everywhere in my office. I am trying to ward it off. Great celebrations for you on Sunday! My sinus infection began around Thanksgiving and I still don't feel 100% better. Definitely go to the ER - I went and found out that I also had a bladder infection. It might be best to go and get a medicine prescribed. This season has gotten me all right up in the feels -- I don't know anyone in those photos but the two at the end, one with Ricky's brother, and the next one without him but with his son - well, I'm teary-eyed now. Not ready for Christmas, not ready for the last week before Christmas, but super-thankful that the crud hasn't hit our house yet. I've been hearing horror-stories about it though. Not the flu but feels like it and takes a long time to get over it. While I'd appreciate any forced time away from work, I'd rather not do it that way! Sure hope Ricky starts feeling better soon! Oh no, I'm so sorry to hear that you and Ricky have been so sick-- prayers you're both on the mend soon. So glad you were still able to celebrate Christmas with his family, it looks like you guys had a wonderful time. Oh no, I hope Ricky feels better soon. That sounds miserable. I see Gilmore Girls on your TV, yes! Haha. Aww what sweet blondies. You have a great family :). ugh, have sinus issues is no fun! I've been there done that, way too many times. Glad you had a good party and were still able to do some Christmas time partying. It is nice when you get really good vegetarian food! I would often just have mashed potatoes and maybe brussel sprouts for a long time at dinner...partially my own fault, I am too lazy to make anything yummy and bring it. You and your Mama are precious! Love your outfit you have on in front of the tree and I hope you and Ricky are feeling better soon! Nothing is worse than being sick during the holidays! So sorry you guys have both been feeling so bad. But it sure looks like you had a good time with your family. Oh my you look so much like your mama! What a fun day and what a great family celebration yesterday, such sweet sentiments and I think sometimes people forget how hard the holidays can be over the loved ones we've lost. I sure hope you and the Mr. get to feeling better soon my dear! You look so much like your mom! Both of you have flawless skin! Poor Ricky! Seems like he's had this mess for a while! I got something from one of the kids, ugh. Hopefully it's gone by Christmas. Glad y'all had a sweet and nice Vincent Christmas! 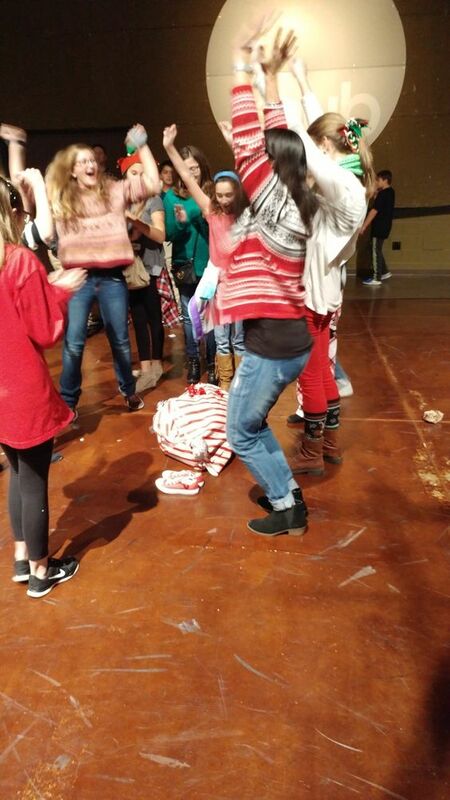 I went to my friend's ugly xmas sweater party, & thats it! and I am SO ready for this last week before XMAS. Finals are now over & once I find out I passed all of my classes it's time to spend 5 days w/ my fam. I can't wait. I hope you & Ricky feel better! He's a trooper - I would've been to the ER/doctor within the first few days feeling like that! You take care of him! Aw, poor Ricky. Hope he's feeling better soon. I love those brownies that you made him. So glad you guys had a nice family celebration. You are so right. Time and photos are both so precious! Love all the photos from this weekend. I hope Ricky is starting to feel better. And that you are as well. That was so sweet of you to make him a blondie. 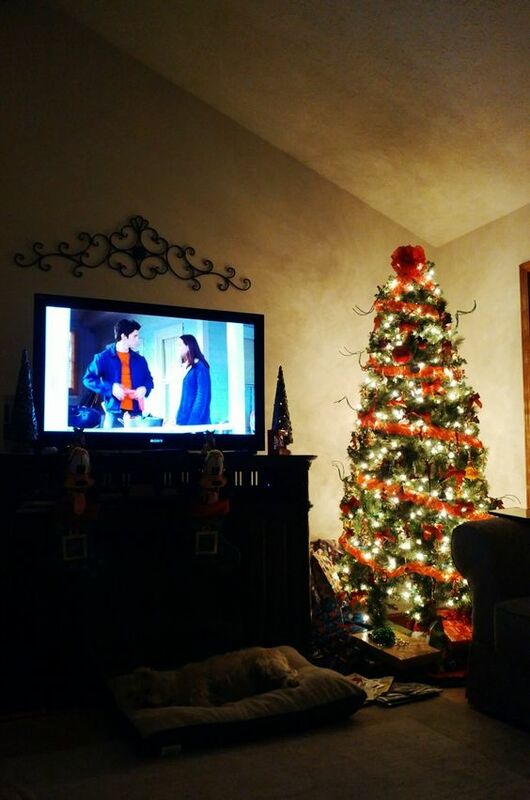 There is nothing better than cuddling on the couch with a lit Christmas tree and Christmas movies!!! Hope Ricky is feeling better now. Mine just started last night!!! Enjoyed all your photos. Merry Christmas! I can't believe that Christmas has already come and gone but we are like y'all...we start celebrating Christmas early and it makes it so much easier to see all of our family! Evan is such a cutie!